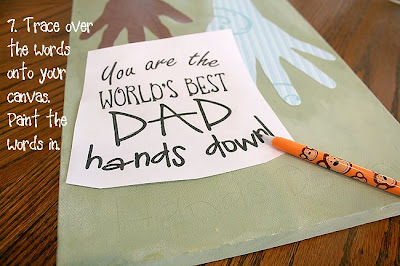 RootsAndWingsCo: Hands Down Best Dad! I swear I am having too much fun making things lately. And I'm in love with each thing I'm making. Maybe it has a little something to do with the reason I'm making them. I love my husband and I adore making him things. Maybe it is an addiction. I probably need help. I know everyone has seen shirts with a similar saying. As I was making the other Father's Day project with Katrina's saying, I couldn't help making this too. I figure, my sweet can take one to work and keep one at home. He is good and loves this kind of thing. 2. Paint your canvas. I like my backgrounds mottled. But you can paint it nicely just one color if you like. 3. 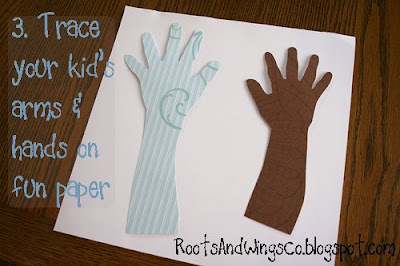 Trace your kid's arms and hands onto fun paper. I thought these were fun papers because they had designs in them. The brown one is hard to see, but there is a fun pattern on it too. 4. Oh Mod Podge! Why do you mock us so? I mean who calls it Mod Podge? We all know the name should be Modge Podge, right? Well get out your Modge Podge and plaster the hands down. Make sure you leave enough room to paint your saying on. 5. 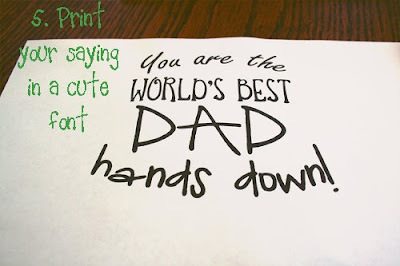 Print your saying using cute fonts, onto regular paper. 6. 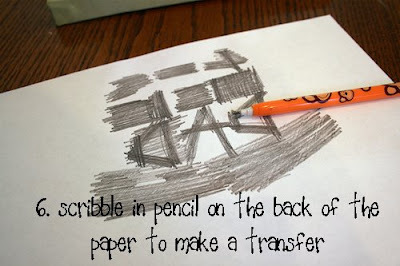 On the back of your paper, scribble with a pencil to make a transfer. Make sure you get all of the back of each letter covered. 7. 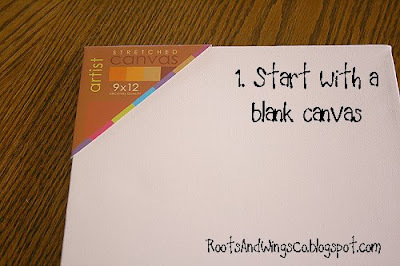 Put the paper on your canvas. Trace over your saying. It will leave a light imprint for you to paint the words in. Spray it with sealant or cover with some coats of Modge Podge. **Little details I added....I loosely *traced* around each hand with some brown paint. I also painted in my boy's names next to their hand. It is small (and blurred out) but it is there. I love this idea. Thanks for sharing it! Love this idea! Think we are going to do this for hubby! I so want to do this next year... what a treasure!!!! What a fun activity and it turned out so nice!!! 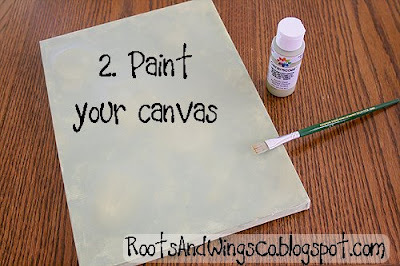 I think I may try it at home and let the kids dip their hands in paint and press for the hands. Thanks for the great idea! Thank you! I needed a frugal idea for this weekend, and this covers it. Thank goodness there are plenty of blank canvases in the basement. What a super idea! Hope you don't mind that I highlighted you on our blog at atticgals.blogspot.com. LOVE it! Will the canvas look ok if I only have "one" hand? We only have one son but I love the idea. Could I maybe do both of his arms? I love these. We're making the quilt one, on a canvas and the canvas one on a tshirt. What fonts did you use. You found some really "cute" fonts and I'd like to use them. Thanks. fantastic craft! was just looking for father's day ideas and found this one of yours from last year. but i dont think mine will turn out this well - your's is amazing. thanks for sharing! I found you via Randomhandprints.blogspot.com. I'm definitely doing this for a card or sign. Thank you! Love this idea. I'll be mentioning it on my blog today! 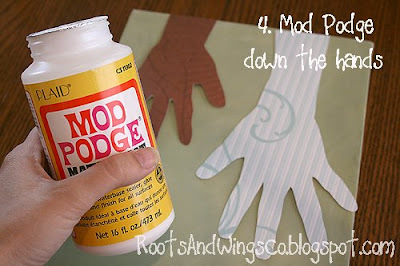 Are you using the Matte Mod Podge? All I have is Gloss. Would that be weird? How did you paint the words in? 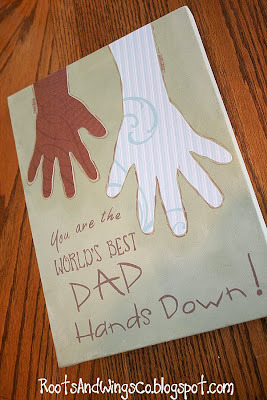 We all know that nobody's perfect so even if we don't have the best dad, we must love and appreciate them.